The WORLD'S ONLY vector gaming system! Perhaps the most unique gaming system I ever came across. The Vectrex is a stand alone 8-bit (6809 processor with a 1.5Mhz clock speed) game system that only uses vector lines (not sprite or pixel based like most game systems) like in early 80's vector hits like Atari's Asteroids, Battlezone, Tempest, and many others, plus it displays it all on the Vectrex's very own monitor. The system is only about 16 pounds too so it's just like your own portable arcade machine, all you have to do is plug it in and turn it on and you're ready to go. The Vectrex even comes with a build in game called Mind storm, which plays a lot like Atari's famous Asteroids. Although the 9 x 11 screen only appears in black and white, most Vectrex games should come with cool screen overlays that cover the monitor to hide on screen flickers and create the illusion of colour if you like (it's also fun to switch overlays per game to see the different looks). The Vectrex had its fair share of arcade hits like Scramble, Berzerk, Pole Position, and others so there's a nice selection of titles available and thanks to the powers of the Vectrex, you could see some early signs of scaling and 3D in the games. Sadly the Vectrex never made much of a impact back then because of its high price tag ($199.99) and the poor video game market didn't help matters much either. Plus the system always has a real annoying buzzing sound that can't be turned off no what you do to the volume control which really got on my nerves at first. If this system reminds of anything then it reminds me a lot of the Virtual Boy by Nintendo. First this is a stand alone system (no TV needed), second it's only in black and white (the VB is red and black), and finally both systems are widely misunderstood and underrated the public and critics and that's just a shame. The Vectrex controller has 4 buttons with a steel analog joystick that you could easily play for hours with and not feel any discomfort. The controller fits right under the monitor for easy storage after you're done playing. The Vectrex also has an additional controller port for two player games like Armor Attack. With these Glasses made in 1983 you can play three specially made 3D Vectrex games but they are perhaps even rarer then the system itself. The Vectrex 3D Imager Glasses were the first 3D glasses used for any gaming system so it's no wonder why they are so rare. Bottomline: There are over 70 games are made for the vectrex including some new ones on some Vectrex game sites at http://www.classicgamecreations.com/ with new games like Spike's Hoppin', Tsunami, and Vector Vaders. 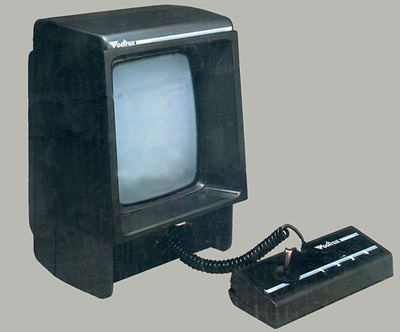 The Vectrex also was a victim to the Great Video Game Market Crash of 1984 and when Hasbro brought Milton Bailey they pretty much cancelled the Vertrex all together. If you call yourself a true video game fan then you owe it to yourself to get the very unique and very rare Vectrex, find it and buy it! Vectrex Rating: 78/100 a unique system to say the least but the games are mostly average, see the reviews. Find Vectrex on eBay here! Rare Scale: 6/10 one of the harder to find video game systems from 1982. Don't miss your chance to get it if you manage to find it. This is Vicky! The Vectrex Girl! *This is a great piece of gaming history, period! *The games look so smooth with those vector graphics. *IT'S NOISY! There is a contrast buzzing sound that never goes away. *Too many Asteroid type clones. 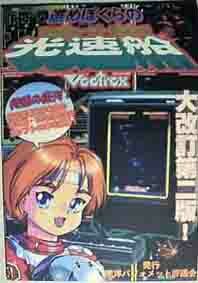 Here is a Japanese Magazine on the Vectrex!